CORBALLY MILL AND PORTION OF THE LAX WEIR The fisherman in the boat is E.B. Place, son of J.H. Place, Manager of the Shannon Fishing Company Ltd., the man paddling the boat is Patsy McMahon from Ardnacrusha. View of the Great Lax Weir and Corbally Mill. 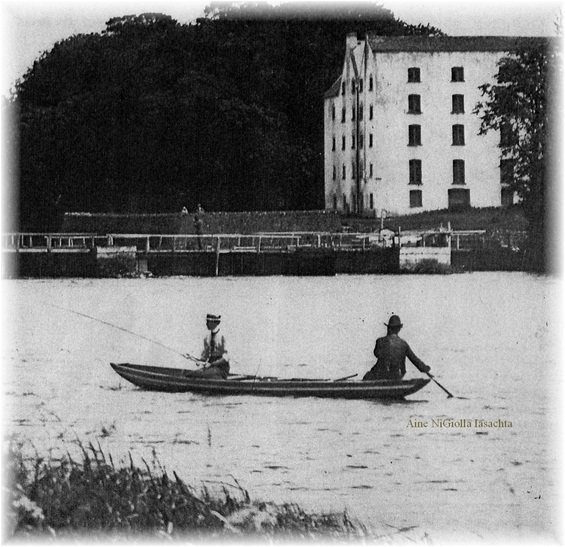 In its time Corbally Mill was one of the finest water mills in the Country. Wheat from the mill was transported via the river in the early stages from Custom House docks as there was no direct road link with Limerick. Corbally Mill, Lax Weir and Castle. 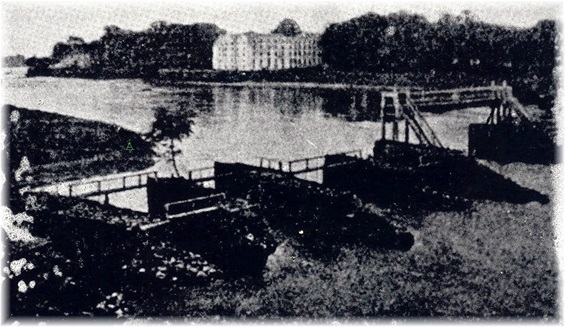 Corbally Mills and Lax Weir showing the Free Gap built in 1865, called the Queen's Gap and Caisleán na Corann (Castle of the Weir). William Walter Copley, a Clerk in charge of the Water Mill, with his family, lived in this house just inside the entrance gate of the Mill Yard. All that remains now are the stone pillars. The house was knocked in the 60's to make way for the present house. END OF MILL ROAD, the Mill section as it is now. 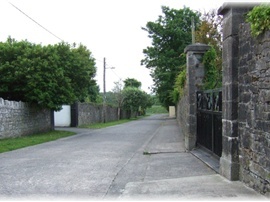 On the right was the entrance to the Mill Yard, on the left Corbally House, now the Nursing Home. I have read with the greatest interest - and no little nostalgia! - your "Short History" of the Abbeymen. Of special interest to me is the reproduction of the photo figure 11 as this portrays my eldest brother Capt. E. B. Place (peal fishing probably) on the "tail of Garrafh" (excuse phonetic spelling!) being paddled by one Patsy McMahon of Parteen, in a brocaun which was very much beamier than those normally used by the Shannon Fishing Co. - as it was then called - snap net men. The normal ones they used were much wider and more stable than those of the Abbey men. This particular brocaun was specially built - probably by the late Mickey Farrell - for one of the Fishery "Star" net men on my fathers instructions as the net man mentioned (Frank Connors) was about 15 stone or possibly more and so generously proportioned that even a Corbally brocaun was deemed inadequate and unsafe to accomodate him !! 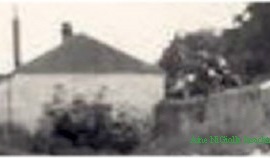 The photo and also figure 10 were I think taken by someone directly - or indirectly connected with my old home, Corbally House and appear to be reproductions of original photos. 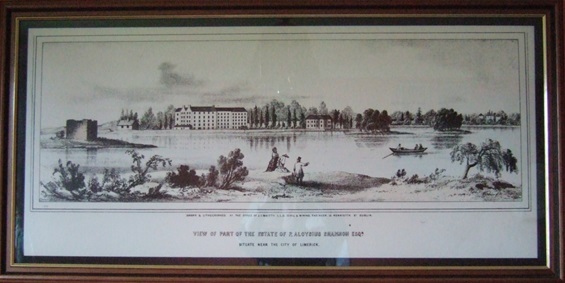 I would be more than grateful if you could let me know who now owns them and whether it would be possible for me to acquire them as I think that during our time there, they were possibly framed and on one of the walls inside Corbally House. Thanking you, I remain, Yours Sincerely, Hugh L.P. Place. P.S. How is my old fishing acquaintance Arthur Lysaght? Please give him my kindest regards. I might be mistaken, but I seem to recall being told that the Mill was once owned, or managed, by the father of the actor Richard Harris. Can you confirm? As far as I know, the Harris Family had a Flour Mill in Mount Kenneth. Names associated with Corbally Mills are: Bindon, Gabbett and John Norris Russell. Hello Anne,could the photo of the 2 men fishing be used with permission?